It’s been almost three weeks since news of Kyrie Irving‘s trade request broke, yet he still remains a Cleveland Cavalier. While many teams have reportedly reached out with trade offers, nothing has been enough to convince Cleveland to pull the trigger. This, of course, is the right move for the team to make. Irving is a four-time All-Star, entering his prime with two more years of team control. The Cavs taking a sub-par return in exchange for his services has the potential to both hurt their chances this season and essentially grease the wheels on LeBron James‘ departure next summer. At the same time, while Cleveland is wise to play the waiting game and ensure it gets a solid offer, it’s also running the risk of not making a deal by the time players reconvene for training camp. Based on how this story has developed since breaking, it’s difficult to see the positives from a grumpy Irving returning to Cleveland to play alongside James despite this being the main reason he wants to leave in the first place. Based on an article from Bleacher Report’s Ric Bucher, some within the Cavs organization are actually holding out hope for such a scenario. Per his story, there remains faint optimism this whole situation can smooth over, leading to Cleveland retaining Irving and carrying on with the roster as is. While this positive mindset amidst a chaotic offseason is admirable, it remains difficult to see something like this actually playing out. The Cavs may wish their two stars could just let bygones be bygones and work together for another potential Finals run, but their holding out hope for this has a huge potential to backfire. To be fair, neither Irving nor James has said much since this story broke. Sure, they’ve both taken the kind of social media jabs you made while you were a freshman in high school. Still, we technically haven’t hit a point of no return. At the same time, Cleveland is already walking on eggshells coming into this season, with or without Irving. The “LeBron’s Leaving: Part II” rumor mill has been running overtime this summer, with many (national) writers and pundits thinking his departure next year is a foregone conclusion. While common sense says a lot can happen between now and then, the Cavs still have to do everything they can in the coming season to convince him staying home remains the best option. Willingly letting Irving come back to camp despite his reportedly sour relationship with James certainly doesn’t help the cause. The fact the initial story was almost immediately followed by word James was not going to get involved with the whole ordeal certainly indicates he won’t be the one extending the olive branch. So, it certainly appears as though remaining hopeful for an in-house resolution is reliant on Irving reaching out to patch things up with James. Nothing he’s done on social media since this started indicates this is at all likely. As a result, letting this drag into training camp could be a recipe for disaster. Any attempts to brush off chemistry concerns will likely be all for naught, considering the media will be asking both James and Irving about the whole ordeal as long as the latter is still on the roster. If this were to bleed into the regular season, who knows what kind of effect it could have on Cleveland. In a year where the team is once again facing “championship or bust” expectations, a clash between the two best players on the roster could send the season careening off the rails. This, of course, puts the Cavs in an unenviable situation. 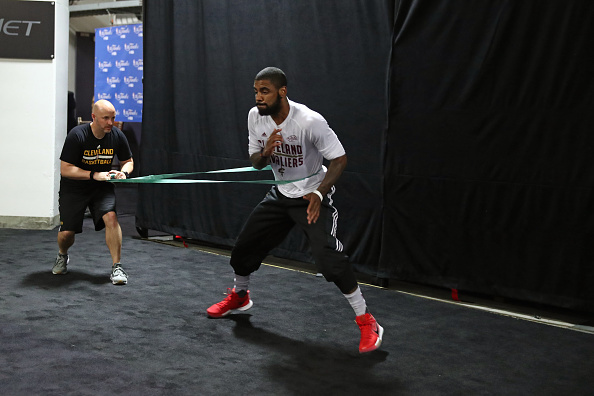 Any sort of added pressure to move Irving before camp only increases the chances of taking an uneven deal. Bucher’s article noted sources who believe Irving will eventually be traded to the Phoenix Suns for Eric Bledsoe and a draft pick. It’s safe to say Cleveland wouldn’t be on the winning end of this deal. However, this is the risk the team faces in remaining optimistic for this situation to resolve peacefully. Again, though, this is all based on the idea James and Irving won’t be able to hash this out. Stranger things have happened, so we can’t completely discount the idea these two could put this all behind them. Right now, though, odds don’t favor this coming into fruition. As a result, Cleveland may want to avoid holding out hope for a happy ending here.